Veterans, VA employees, Army National Guard members, community leaders, students and members of the Department of Homeland Security were among the approximately 300 people who attended the 2nd Annual Vietnam War Remembrance Ceremony coordinated by the Warriors United in Arms, which took place on April 6 at Hanna Early College High School in Brownsville, Texas. 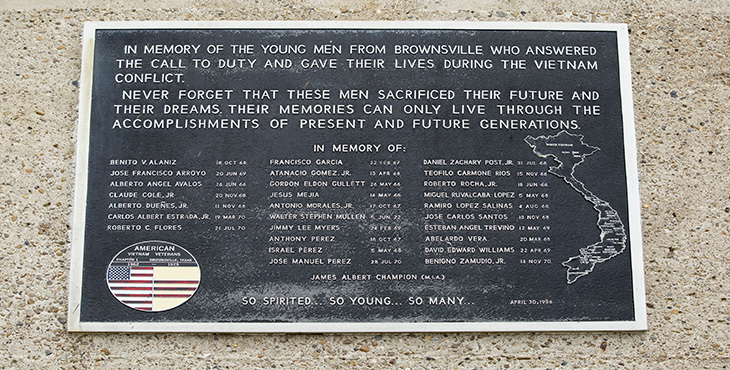 The ceremony honored the 28 service members from Brownsville who did not return after the Vietnam War. “Our nation’s Vietnam War Commemoration is an opportunity for all Americans to recognize, honor, and thank our Vietnam Veterans and their families for their service and sacrifice during one of the longest wars in our country’s history,” said Homero Martinez III, the associate director for VA Texas valley Coastal Bend Health Care System, who served as the ceremony’s keynote speaker. Although most Americans may have express their tremendous gratitude to this generation of warriors and their families between the designated days of March 25 through 29, VA Texas Valley Coastal Bend Health Care System extended its observance of the commemoration in order to synchronize efforts with Warriors United in Arms and other community partners. Living U.S. military Veterans who served during the Vietnam War were offered Vietnam Veteran lapel pins before and after the ceremony as it was officially designated as a dignified public presentation. 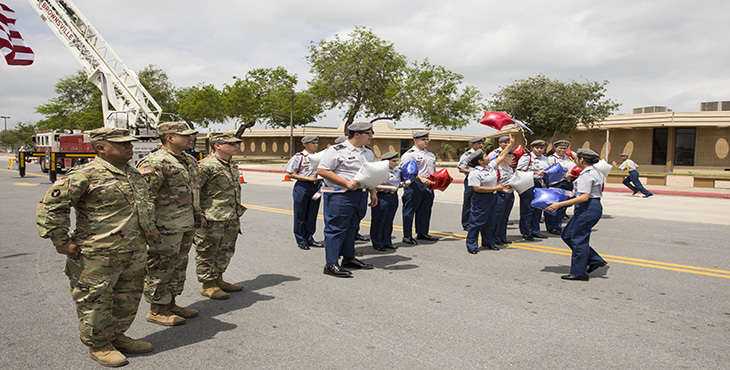 During her opening remarks Terri Alarcon, area assistant superintendent for the Brownsville Independent School District, said it is important students see how their community continues to honor our Veterans for their sacrifices and service. “Events like this ceremony allow our students to see why we say that our country is the land of the free because of brave,” added the proud daughter of a Marine who served in Vietnam. The local U.S. Customs and Border Protection Color Guard presented the colors as the Hanna High School Choir sang the national anthem, which was followed by the crowd reciting the Pledge of Allegiance to the Flag of the United States of America, which was led by World War II Navy Veteran J.A. Perez. 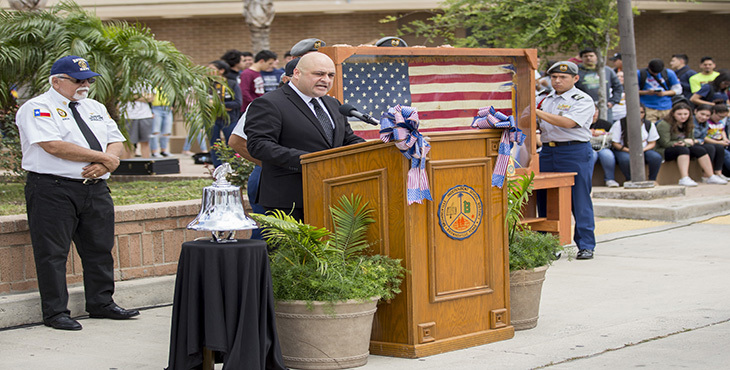 Perez later participated in the placement of a wreath by the memorial plaque dedicated to the hometown fallen Vietnam War Veterans, which is permanently located at the base of the large B-shaped statue in front of the high school. After the speech given by retired Air Force Maj. Martinez (keynote speaker), two local musicians played the solemn military bugle called “Taps”, which moved several of those in attendance to tears. 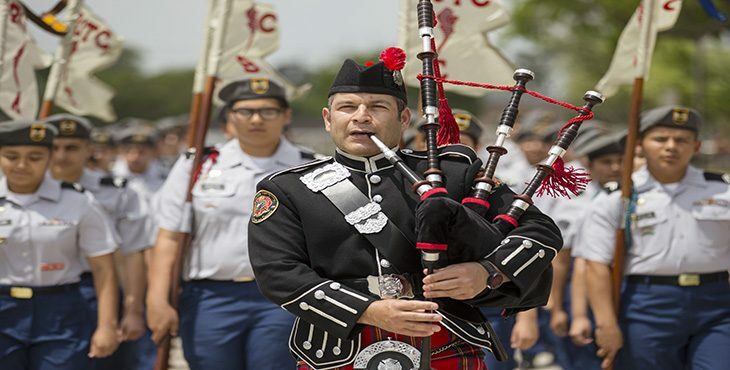 A 21-gun salute was then performed by the Warriors United in Arms firing party, followed by the release of a balloon by cadets every time a bell was rung after the name of each one of the 28 fallen Vietnam War Veterans was read aloud. One balloon was released by a local firefighter from a height of more than 30 feet. Brownsville Fire Department Ladder 141 used a fire truck as the base and pole for a 45-foot long U.S. flag that proudly flew during the remembrance ceremony. The event also featured two special items on display. 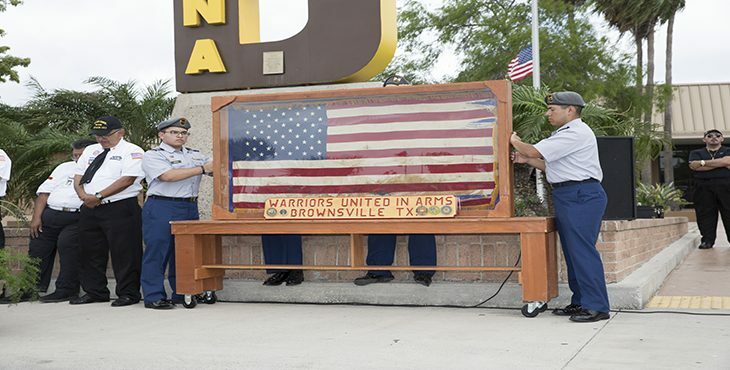 The Warriors United in Arms created a mobile memorial wall of the 28 Vietnam War Veterans from Brownsville that were killed in action. According to a public announcement from Warriors United in Arms during the ceremony, James Albert Champion’s missing in action status was recently changed to killed in action. The other special item was the last U.S. flag removed from the U.S. Embassy in South Vietnam, which was the ceremonial version which stood in the U.S. Ambassador’s office during the fall of Saigon in 1975. The local Veterans service organization set up the memorial wall and flag display for public viewing during special events such as the remembrance ceremony. Led by the Department of Defense, VA has more than 465 commemorative partnerships in recognizing the 50th anniversary of the Vietnam War. 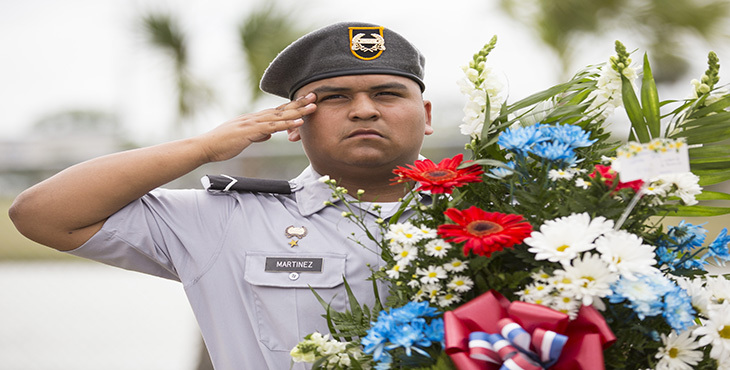 In fact, VA is proudly hosting more than 775 events to recognize Vietnam-era Veterans who served between Nov 1, 1955 to May 15, 1975, regardless of duty location around the world as all answered a nation’s call to service. VA also joins more than 11,000 local, state and national organizations who have partnered to assist DoD in honoring the 6.6 million living Vietnam Veterans. Author’s note: In observance of our nation’s commemoration for the service and sacrifice of Vietnam War Veterans the public affairs office at VA Texas Valley Coastal Bend Health Care System has created a digital photo album in honor of the 28 fallen Vietnam War Veterans from Brownsville, Texas, using the information provided by Warriors United in Arms and other sources. 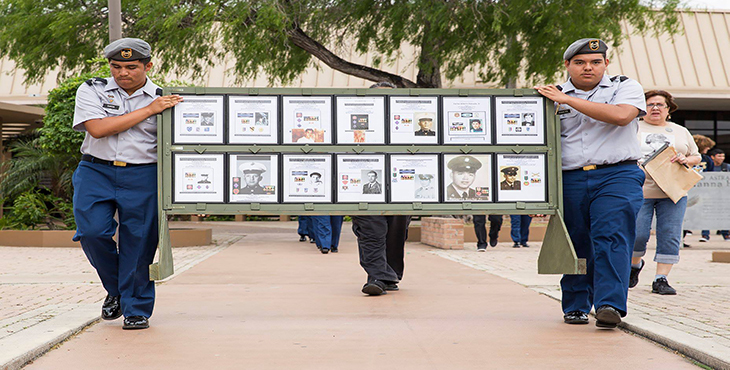 Click here to view the images and learn more about each of these Veterans who laid down their lives while in service to their country. If you served in support of military action in Vietnam you earned the service medal. What’s your DD214 say? I’m a Vietnam Veteran… Too many times have I thought how hard it was to come home to a country such as the USA given so much DISRESPECT for the time I spent in Vietnam… So much hate towards us Vietnam Vets from our own country. We were called drug addicts, baby, and women killers, dope heads and a few other ungrateful words… If I had to do it over again, I would! Even when I applied for a job after my time in the service, the employers where I tried to get a job would see that I was a Vietnam Veteran and I would be shown the front door, for they had no respect for me or wanted to employ me in their business… So many times I was turned away from good paying jobs.. I always wondered how my life today would be like if I was hired for the job I wanted…. 100% agree …. totally the truth …..I was there for 13 month 68-69 and went to same experience when I returned !! !